Kanchenjunga 8586m. (3rd highest mountain in the world) is situated on the far eastern side of Nepal, shares the border with Sikkim, a tiny Himalayan state in the north-eastern part of India. It was first climbed in 1955 Special, restricted permits are needed to trek in this conservation areas. The far-east region of Nepal provides unique treks along rarely visited trails.This mesmerizing trekking trail begins along the Tamur River through pine trees and villages where traditional life is little touched by the modern world. Walking through cardamom field, flowing river, waterfalls, small villages and the beautiful stone built houses, bridges, colorful forest rhododendron and pine forest, etc. will meet your zeal to trek in eastern Nepal. The peaks and mountains are visible in a distance. This region is a treasure of flaura and fauna Deer and wild sheep are often spotted in the distance and birds are found in abundance. The region is home to ethnic groups of Kirants, notably the Rais and Limbus. 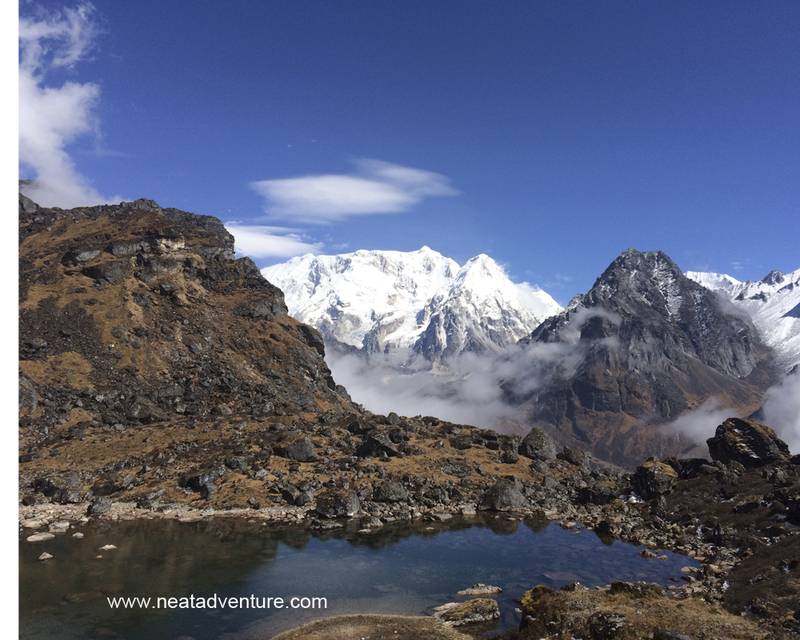 Today, Kanchenjunga trek has become one of the demanding trek for those who is seeking more authentic, remoteness, challenging and altitude. Only few numbers of tourists visit this region and you will meet only few other trekkers on the way. Participants should be physically fit enough to walk for at least 6 hours a day. In some days, the trail can go very steep up and down simultaneously. 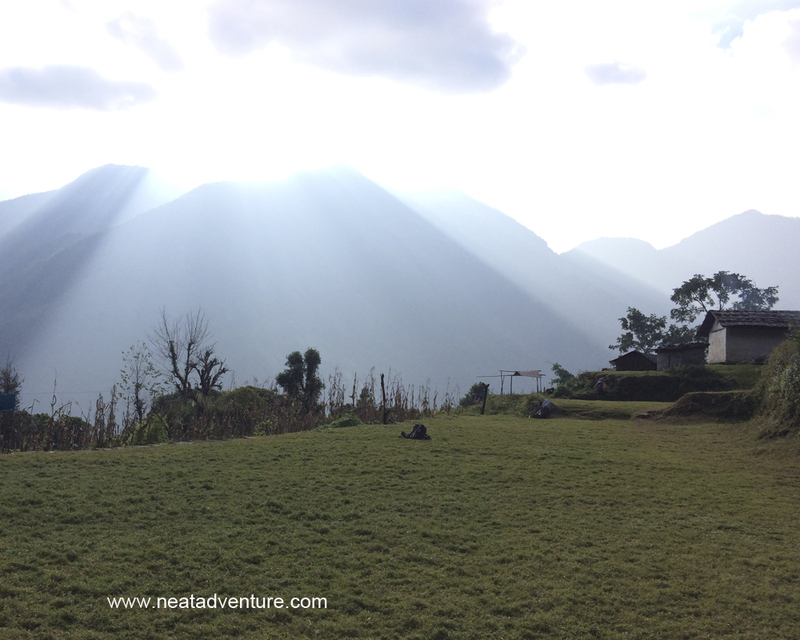 The teahouses and lodges are not developed like in Everest and Annapurna region. They only can cater up to 10-12 people with basic facilities. In the higher settlement, the foods are comparatively expensive because all the things have to be carried up by people’s back. 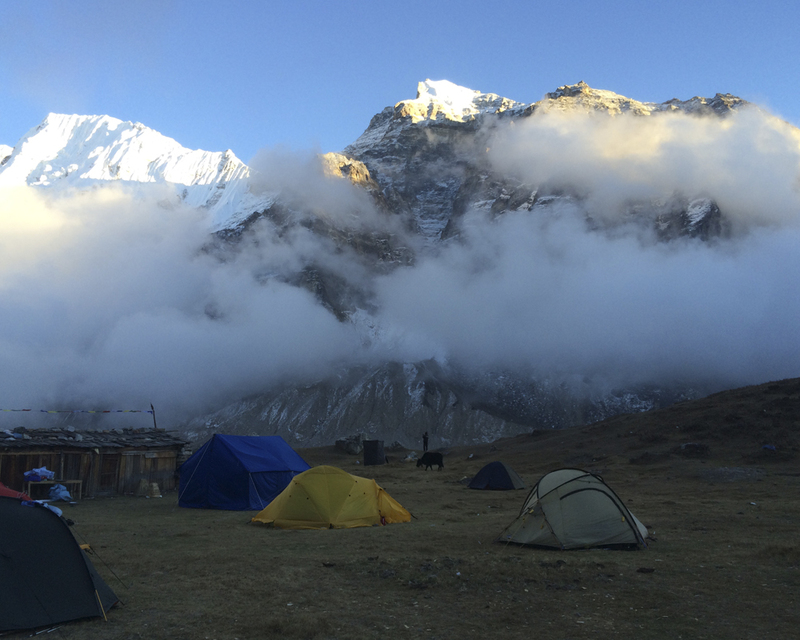 So, the trekkers often prefer the camping trekking. In general, the region has not developed to cater to independent trekkers so groups must be fully self sufficient. The first option is flight to Bhadrapur which is about 45 minutes flight from Kathmandu and then drive to Taplejung which is about 6-7 hours approximately and start the trek. Recently from 2015 september, they are having two scheduled flight in a week to Suketar. The other option is driving to Basantapur which needs minimum of sixteen hours drive from Kathmandu. There are no tourist bus service so trekkers must either use scheduled bus services or arrange private transport. 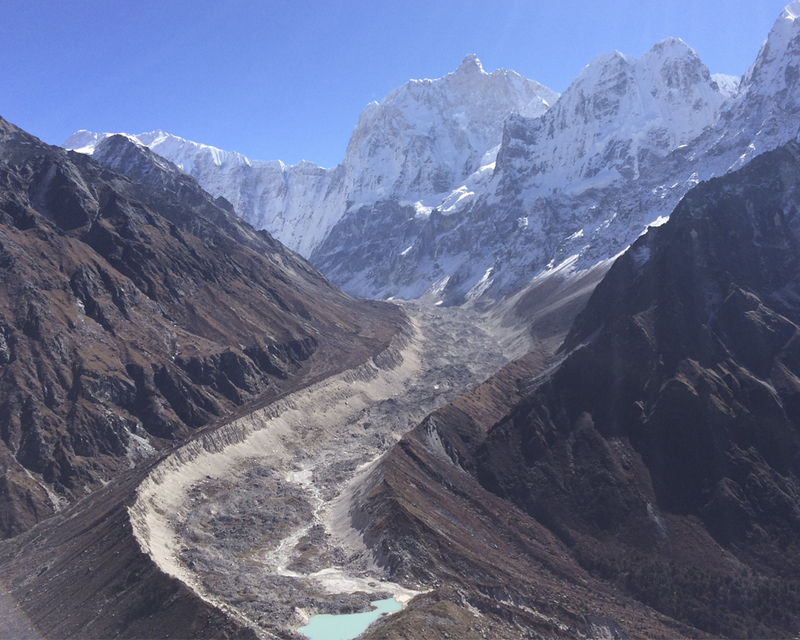 Permits and fees: Much of the trekking area lies within the Kanchenjunga Conservation Area and a Permit fee is required for entry. The special permit is needed to trek in this conservation area. Trekkers arriving via Kakarbitta border point must first travel to Kathmandu to obtain trekking permits as the government immigration office at Kakarbhitta doesn’t issue he required permit. Best Season: The best time to trek in the region is between March-May and September-November. Fly to Bhadrapur /Suketar/ -& drive to Taplejung : After arriving at the Bhadrapur airport, meet all the trekking and drive to Taplejung. It is about 6 hours drive via the beautiful tea garden of Phikkal and Illam. You can stop at Phikkal for lunch and overnight at Taplejung. Taplejung to Chiruwa(1270m): The first day is an easy day, walk through underconstruction road, that goes downward until you cross your first suspension bridge. You can stop at Mitlung for your lunch and continue further. On the way enjoy the landscapes, village and the welcoming locality to Chiruwa. The total hike for the day is about 6-7 hours. Chirwa to Sekathum(1576m): Trail continue along the Tamour river you will reach to Tapethok(1380m.) . Here, you have to check in the entry point to Kanchanjunga conservation Area. Cross the suspension bridge and follow the river along with cardamom field and reach to Sekathum. The total hike for the day is about 6 hours. A step and long climb up a reasonably good trail for 5 hours to Amjillasa . One can enjoy a beautiful waterfalls, good views of valley, river below and Himalayan peaks in the distance, several open yaks grazing pastures exist here. Amjilassa to Kyapra/Gyabla (2820m) It is a hike along the riverbanks through densely forested hillside (bamboo, fir and scattered rhododendron). The river drops steeply with many waterfalls and crystal clear pools. Climb up to green pastures just beyond a group of Buddhist stone houses at Kyapra. The total hike for the is approximately 5 hours. Kyapra to Ghunsa( 3480m) The trail gently undulates with a few steep uphill portions.Passing through the village of Phale (lunch point) and visit a Buddhist Gompa near to village- much Tibetan art is evident as are the villagers weaving of rugs. Ghunsa is a large Bhotia community of stone houses and tidy small farm. The village is powered with electricity and has hot shower, telephone services. 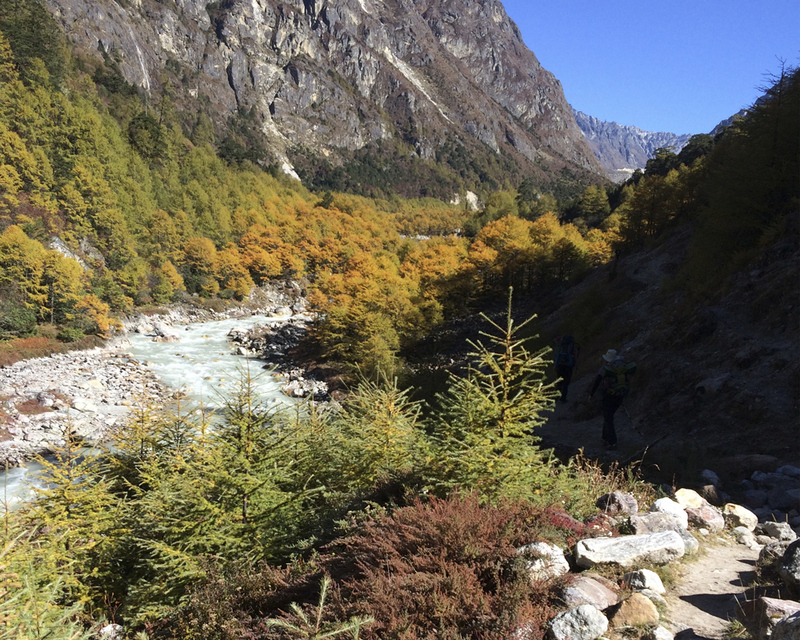 Gunsa to Kangbachen(4000m) Walk along the river with colorful pine trees and rhododendron forest, cross the wooden brige, climb up through technical landslide trail. Enjoy the Kumbhakarna Himal ranges on the way. Kangbachen A rest day is taken here to enable time to relax, bath or take a day walk. Kangbachen to Lhonak (4700m) Trail climbs gradually through open rocky fields to Ramtang(4350m)Walking from here is on large boulders which leads to the terminal moraine of the Kanchanjunga glacier. Terrific mountain views abound in all direction. Lhonak to Pangpema(5065m) or Pangpema: The trail continues along the Kanchanjunga glacier with a moderate to slow ascent with excellent views. You can enjoy the view of Kanchanjunga from Pangpema shorty and come back to Lhonak if its too high elevation to spend a night. Pangpema Wonderful day hikes around or explore in the glacier. 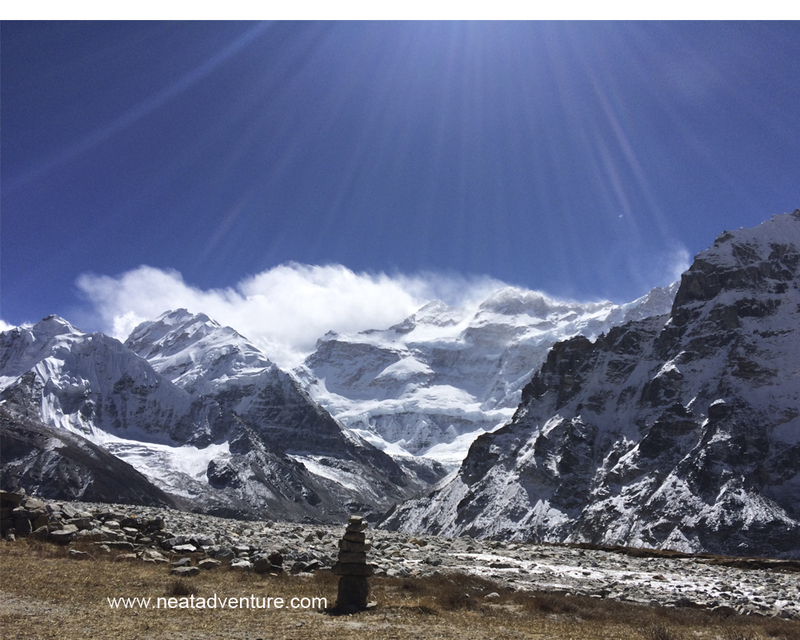 Incredible views of Kanchanjunga and Yalung kang. Blue sheep and musk deer may be seen together with lamergiers tremendous bird(span). Gunsa to Selele Phedi: Climb 4-5 hours up through beautiful forest full of juniper, rhododendron, and pine trees and reach Selele Phedi. Camp at bank so selele river. Selele Phedi-Selele La pass(4480m)-Tseram: Cross through the three passes with the sight of breathe taking mountain ranges. Overnight at Tseram. You can have pack lunch at this day to save time. 6-7 hours walk including uphill and downhill walk. Tseram to Torangding (2995m): Hike downward along the bank of river till torangding, the total hike will be about 4-5 hours. Torangding to Yamphudin(2080m); Trail continues up and downhill through bamboo forest, pine forest, some recent landslides and crossing streams and river to Yamphudin. The hike for day is about 6-7 hours. Yamphudin to Khebang(1915m): Trail descent through the forest, cardamom field and small villages. Khebang to Tellok (1500m): Trail will decent to Tellok encountering beautiful hills, Forest, rivers, rice field and small villages. Tellok to Suketar airport or Birtamod(Bhadrapur airport) It will take about 7hours to reach to Suketar airport or drive to Birtamod(Bhadrapur) by bus. Flight from Suketar/Bhadrapur to Kathmandu. Depart from Kathmandu You will be transferred to the airport for your final departure from Kathmandu.